I’m feeling a bit nostalgic today- I don’t know if it’s thinking forward to my son’s first grade Valentine’s day party, which leads remembering my own youthful days, or that for some reason the name ‘Butter Bean’ is stuck in my head, which makes me think of my grandfather, but I guess there are worse things to be and worse times to be it. I’ve been busy lately- I finished my portfolio, which is very exciting for me. I designed it and began implementing it a year ago, and it was becoming a little embarrassing to not have it done. In my defense, once I designed it and wrote the beginning of the functions out I stopped almost 100% to focus on other projects for other people. But you’re probably not here for nostalgia. So today’s freebie it is. This one is a set of two different print-and-cut designs that match. They are two different styles of window boxes. For the larger one I used Clear Craft Plastic for the window (so the kisses don’t get lost!) and for the smaller ones I left the window open and used a glue dot to stick it to the bottom. I printed on (and cut from) Georgia Pacific Bright White 110 lb Cardstock. 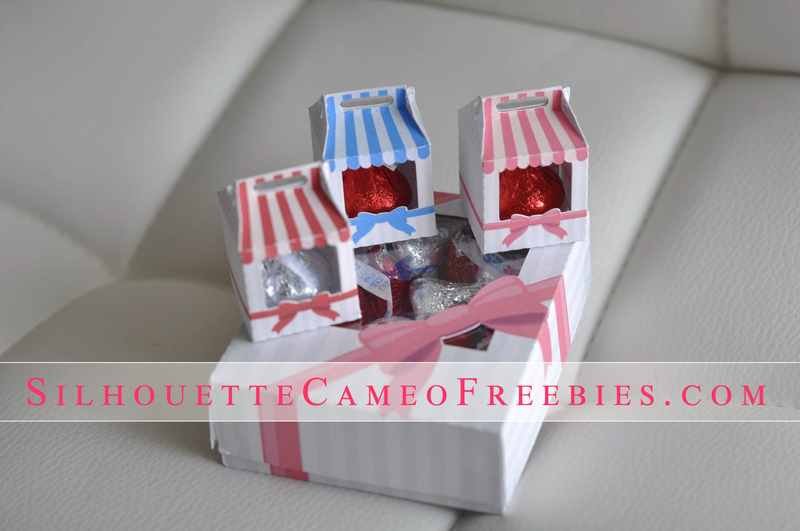 I did another set of the smaller boxes last Valentine’s day (Valentine’s Hershey Kiss Boxes), but this year’s is a little different. Instead of score lines, I used perforated lines for the folding lines. I found they folded a lot more easily this way. Thank you all SO SO SO MUCH for supporting this project!